We’d planned out a circuit for autumn leaves in Japan a few years ago but for a number of reasons the timing just didn’t work out. Fate stepped in this year and everything fell into place for us to head away in November for a few weeks so I got to work pulling together an itinerary. On this trip we took advantage of the Jetstar Australia multiple cities booking process allowing us to fly into Osaka arriving at Kansai Airport, follow the Golden Route and autumn leaves east at our own pace and depart through Narita Airport, just out of Tokyo, a couple of weeks later. This option saved us time and the cost of back-tracking to Osaka which meant we could squeeze a couple more adventures into our stay. The Jetstar website allows you to book multi-city tickets directly online from most major Australian cities. What is Japans Golden Route? While we love exploring Japans smaller cities and less travelled paths and will continue to do so on future visits, the Golden Route bears its name and popularity for a very good reason. It’s a stunning part of the country, offers a diverse range of scenery and experiences and it’s easy to access either by tours or self-guided using the efficient public transport system. The region is well equipped to handle large volumes of tourists without becoming overwhelmed by them and for English speaking travellers language is really not a barrier. The typical ‘Golden Route tour’ involves 5-6 days flying into Tokyo and out of Osaka and will generally take in Hakone, Kyoto and Nara along the way. This is the tourist trail in Japan that has been popular with a few small variations amongst foreign tourists for over 30 years. Despite having been to Japan a number of times we’d not specifically done the Golden Route before although to be fair we did triple the time, turn it on its head starting from Osaka and add in some additional side trips along the way. Seasons have always been super important to the Japanese. Back in the early 11th century when lady-in-waiting Murasaki Shikibu penned Tales of the Genji, famously the worlds first novel, she waxed lyrical about the autumn leaves, cherry blossom festivals, wisteria leaves and fireflies. All these centuries later the Japanese are rightfully still enraptured by their natural surrounds. To tell the truth it’s a bit catchy and I find myself planning our own travel dates and itineraries over there around seasonal elements and festivals. 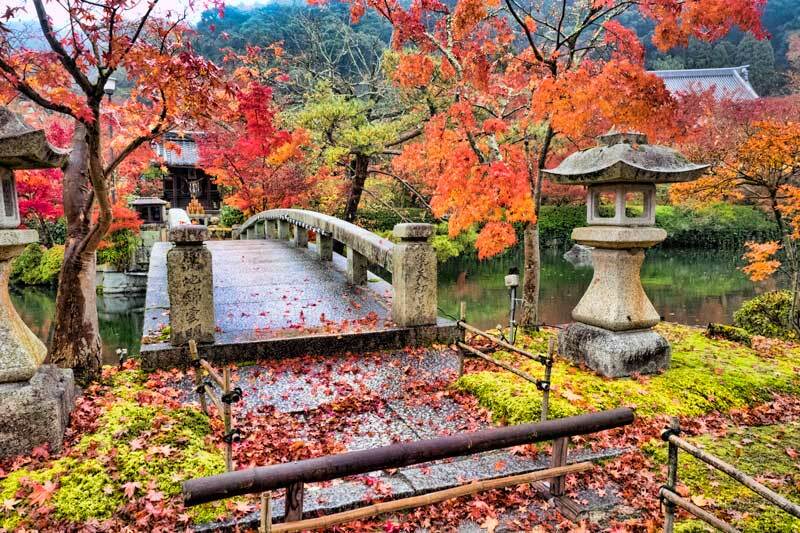 A visit focused around the autumn leaf season, known as koyo in Japan, is ideal along the Golden Route because the cities are at a similar latitude and elevation meaning seasonal conditions will peak within a few days of each other, usually in late November and early December. By contrast I’d seen some beautiful autumn leaves in the hills around Sukayu Onsen in Aomori some 2 months earlier so if you’re prepared to travel further you can enjoy autumn leaves in Japan across a longer period. I sometimes wonder if the Japanese are so at ease with planning their annual vacations around the country on something as fickle as the weather because of the country’s largely Buddhist spiritual belief system. One of the fundamental teachings of Buddhism is that happiness comes in acceptance and letting go of attachment, it’s something to keep in mind when you are planning a trip to the other side of the world on the hope of being somewhere on the exact day that a blossom will open or a leaf will hit that magical shade of ruby or gold. Seasons don’t run to exacting timetables and the peak can arrive several weeks earlier or later than the annual average so there is an element of luck involved in seeing a particular garden or temple in full colour. I’ve readily admitted that one of the reasons I love travelling in Japan so much is the food and Japan does seasons especially well for us foodies with seasonal dishes, treats and drinks widely available. This is more than just eating fruit and vegetables that are in season it can be seen in everything from street snacks to confectionary and even your Starbucks latte. I’ve loved the sakura specialities in the past and couldn’t wait to see what fall flavours we’d find. As we travelled around I fell in love with chestnuts pressure steamed to soft and fluffy perfection in small rural laneways and parks, to me they were almosts like a yam in their texture and flavour or the New Zealand kumara, somewhat surprising for a tree grown nut. 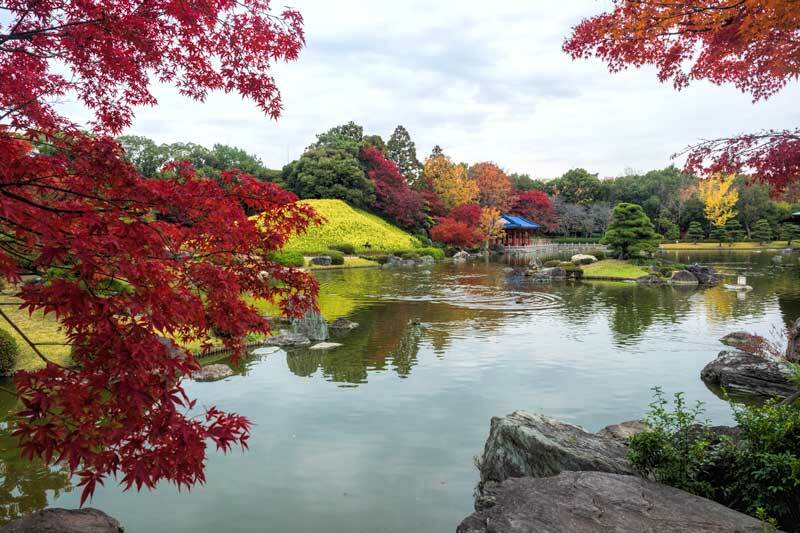 The number one spot for enjoying autumn leaves in Osaka is not in the city itself, it’s a short trip into the suburbs but well worth it not only for the leaves themselves but the historic feel of the area, the beautiful park and waterfall. Minoo is also the home of the tempura maple leaf which you must try while you are there. The unique Minoo recipe involves salting them for 12 months before dipping in the tempura and frying them to crispy perfection. The locals say that is why theirs are the best. Ever wondered what a maple leaf tastes like? Of course I did and had to give them a try, not surprising it was more crispy tempura, not overly leafy at all but a pleasant snack alongside the river. 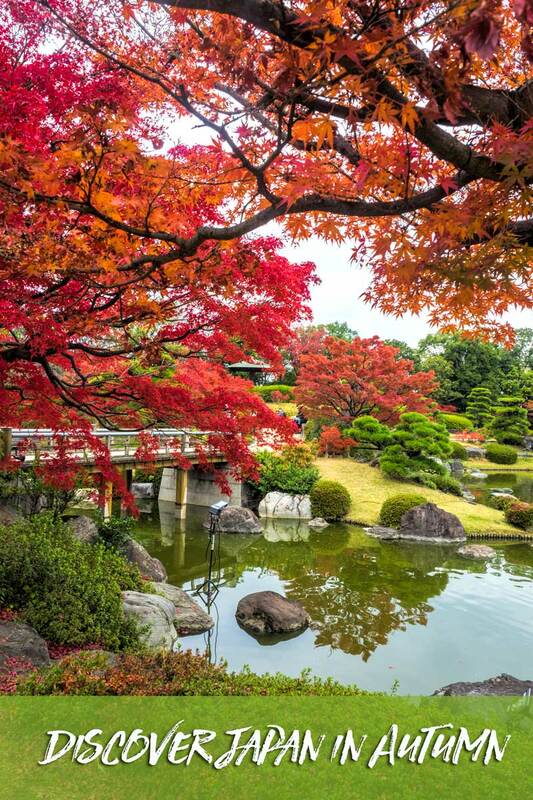 The castle is another top autumn leaf spot in Osaka and it is beautiful but I would personally give second places to this Japanese garden in Sakai, a suburb of Osaka and just 20 minutes by train from the city. We visited here to see the kofun, historical burial mounds dating back to the 5-7 th centuries but it’s this garden in its glamourous fall colour that took my breath away. We stayed way longer than we had planned but every path and turn gave another gorgeous view and you can enjoy tea and sweets in the tea house over the lake. Kiyomizudera temple in the hills of Higashiyama in Kyoto is one of the iconic autumn leaf sites you regularly see featured in books and brochures. Of course I wanted to get up there to see if we could catch some colour even though it was covered for maintenance of it’s cedar roof in 2017. If I’m honest though I was equally motivated to visit a small shop in the Ninenzaka on the walk up that sells choux pastry filled with smooth and subtly flavoured custard cream. In Japan they are called shu cremu and this shop called Kiyomizu kyomi does a delicious sakura cream filling in spring so I had to stop in and see what they had on offer for autumn. On the day we visited the choice was only matcha and custard but as both are incredibly good choices we weren’t disappointed. The shop has had a bit of a facelift since we were last here but their specialty treats were as good as ever. If you’re heading up there I suggest you go hungry as the nikuman (meat buns) on one of the side streets on the way up were another find years ago that need a repeat visit each time we’re in the city. My top pick to see the leaf colour in Kyoto is the gardens of Eikando temple. We’ve been to Eikando temple previously in spring time but it was clear to see even then with the maple trees bare that they would make a wonderful display if we were back in the city at the right time. This was one of the spots on the trip that I genuinely believe we did hit at its absolute peak and was so happy that we chose to visit and with our timing. There is a teahouse in the gardens down by the pond where you can take a seat on the red clothed benches and enjoy tea and piping hot dango while taking in the incredible beauty around you. Another popular stop along the golden route is Hakone. This is between Kyoto and Tokyo but closer to Tokyo and can be easily visited on a day trip from there if you don’t want an additional overnight location. We’ve written previously about doing the circuit here with the Hakone Freepass but it’s also a lovely area to explore slowly and freestyle taking in the scenery, small shrines and temples, and soaking at your leisure in the geothermally heated onsens that the region is famous for. I’ll add a link soon to our visit to this gorgeous onsen in Hakone-Yamote, I would find it hard not to return again for a relaxing soak in the future. Tokyo is less known as a leaf destination in it’s own right but there is still plenty of colour. The most renowned and crowded avenue of golden Ginko trees is at Meiji Jingu Gaien Park and it is certainly impressive but there are many others that are unassumingly situated along streets and lanes in the city. The great thing about these is that the Ginko colour up to their golden heights as a result of sunshine levels and then lose their leaves predominantly to the wind causing a carpet of leaves to form below. Therefore a street facing a different direction or in the lee of a particularly tall building extends the cities colourful peak for many weeks. Shinjuku Gyoen is one of Tokyo’s largest parks, there’s a lot to see here but clearly at this time of year many visit expressly to enjoy the leaves throughout the extensive parklands, it’s one of the city’s prime leaf peeping spots and one of the few formal parks in the city where you are able to walk, play and picnic on the grass beneath the trees. 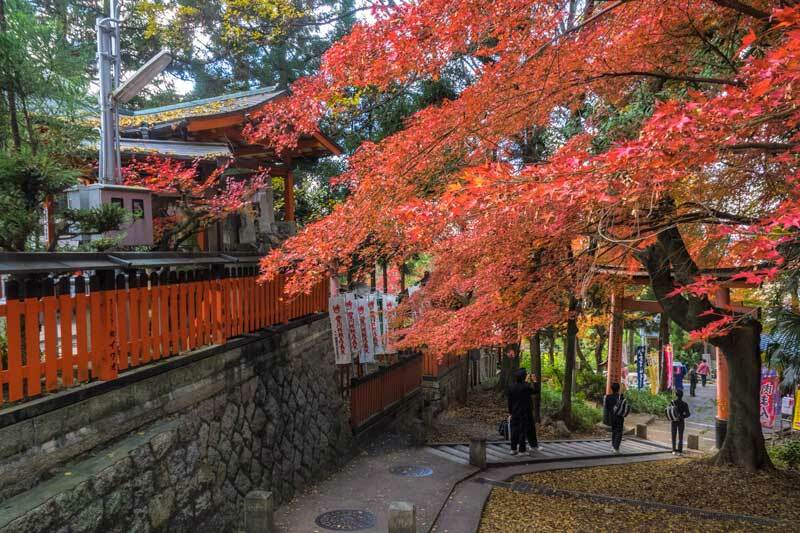 Tokyo’s prime autumn leaf viewing destination is Mount Takao or Takao-san, located within Tokyo but on the outskirts and a day trip destination to get out there and enjoy all it has to offer. You can hike up one of it’s 6 pathways or if time or energy are limited you can take the cablecar or ropeway to the half way point. That leaves plenty of exercise and many of the views and top attractions are in this higher section. The weather and temperature can be extremely variable. Pack layers of clothing that can be easily added to or removed. Once inside your hotel, shops, restaurants and public transport the heat is turned way up so you’ll be taking your coat on and off a lot. 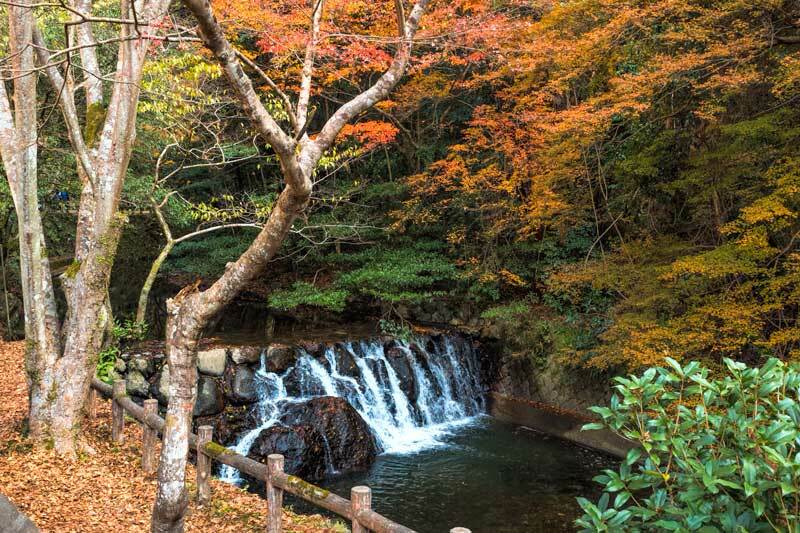 Most destinations for autumn leaves in Japan involve parks, temples gardens and mountain regions. You are going to be on your feet for a good portion of the day so pack comfortable walking shoes. November and December have a lower rainfall than many other months in Japan but weather changes quickly, a small folding umbrella in your bag is always useful although they can be purchased easily and cheaply in Japan. I’ve raved before about Kairo, Japanese heat pads that are worn on clothing close to the body, or in shoes and pockets to keep you toasty warm. As usual this trip I purchased a few boxes to stay warm on colder days plus these are fantastic for any aches and joint pain so I bought a few boxes to come home with me too. Stay as flexible as possible with your plans. Seasons don’t stick to a tight timetable and the peak of autumn colour or spring blossom can vary by a week or two each year. 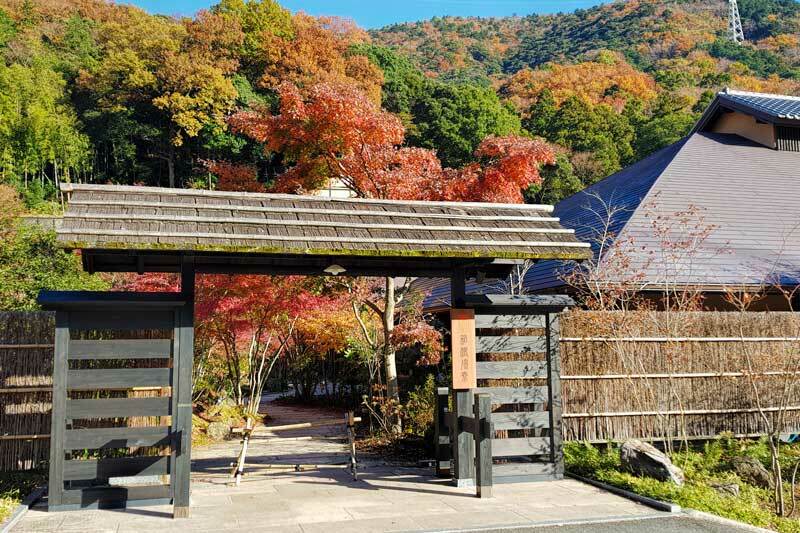 Autumn travel was extremely popular, more so than I had anticipated so I would recommend booking accommodation and any key activities such as onsen days in advance. We use Hotels Combined for our accommodation bookings, they compare the major booking sites to find the best deals and give the flexibility of allowing us to book through those brands we know and trust. For tickets we use Klook, while this brand isn’t as well known in Australia and the US yet it is an established and trusted brand throughout Asia and they have a good range of tickets that can be purchased in advance including JR and subway passes and city passes including the Hakone FreePass and the Osaka Amazing Pass. The autumn leaf colour in Japan is incredible and due to the variation in climates it can be enjoyed across the country for several months of the year. We thoroughly enjoyed it as a season to travel and would love to discover more of Japan in the fall leaf season especially in the smaller towns. While I’d be hard pressed to say travelling in Japan in autumn was better than spring or winter, both of which we have done and absolutely loved, I would highly recommend it if you haven’t already. Lovely post. Having lived there agree that the autumn is an amazing time to visit. Sapporo in the North is where the autumn colours start and it then sweeps across the country. Its magical. Wishing you many more happy trips. If you have the time to follow the leaves you could spend a couple of months from October in Hokkaido down to Kyushu in December. We even had decent colour in Tokyo in early December this year. I was in southern Hokkaido at the end September but was just a touch too early for autumn leaves, if we’d had time to go further north or higher altitudes I’m sure we would have got some as we did in the mountains in Aomori in northern Honshu that same week. Absolutely gorgeous. The only place I have seen in person that rivals Japan – which I have only seen in pictures – is the New England in the USA. I have driven through the area a few times, and feel mesmerized by the range of colors during autumn. But Japan and your brilliant images above top even New England; no small feat. Your photo’s are just stunning. I love all those earthy, autumn colours. Just beautiful.